Bali is not only a romantic sunset and the beach alone. In Tanjung Benoa, you will be challenged with a watersport that adrenaline. 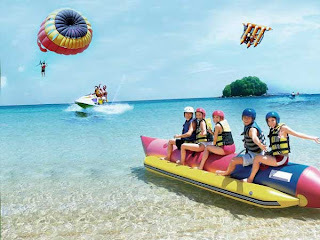 There are various games such as jetski, flying fish, parasailing and much more. game is always supervised by an instructor who will lead you. So, do not worry. While playing jetski, you will drive the vehicle while the hot sun. Together with friends you will increase cheerful as banana boat rides. Or, floating in the air by parasailing and see Tanjung Benoa from a height. Prices charged to visitors to enjoy various water sports range from Rp 150 thousand-200 thousand for 10-15 minutes. Watersport activities at Tanjung Benoa is open from 08:00 to 12:00 pm. 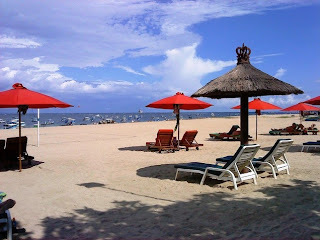 In addition, not far from Turtle Island Tanjung Benoa there. You can interact with the baby turtles or giant turtles, iguanas, eagles, snakes, and assorted other cute animals. Prove your guts and courage to play a variety of watersport in Tanjung Benoa.